June is Alzheimer’s Awareness Month and each year on the longest day of the year — the summer solstice on June 21 — the Alzheimer’s Association promotes The Longest Day events around the nation and across the globe. The Longest Day is all about love for those affected by Alzheimer’s disease and raising funds and awareness to help end Alzheimer’s. Did you know that more than 5 million Americans are living with Alzheimer’s today? By the year 2050, this number could rise as high as 16 million, according to the Alzheimer’s Association. Alzheimer’s disease is the sixth leading cause of death in the United States. Together, with the Alzheimer’s Association, you can help raise awareness for care and support while advancing research toward finding a cure. Why June 21? The duration of the sunrise-to-sunset event on the longest day of the year symbolizes the challenging journey faced by those living with Alzheimer’s disease and their caregivers. Teams are encouraged to turn their passions and hobbies into unique experiences they can share with others as they participate in The Longest Day to honor those living with the disease. Select an activity you love. Do something you love — or honor a caregiver, someone living with Alzheimer’s, or someone you’ve lost by selecting his or her favorite hobby. Pick a way to participate. Start or join a team, host an event, or register as an individual. Choose the way that works best for you! Learn more here. Raise money to move the cause forward. To advance research and provide care and support, each participant is asked to raise funds for the efforts of the Alzheimer’s Association. Plan your day. Find an activity happening near you and plan to join in, or plan your own activity and invite friends and family to join you. For ideas, click here. Participate — and celebrate! On The Longest Day, you’re part of a global movement to help end Alzheimer’s disease. 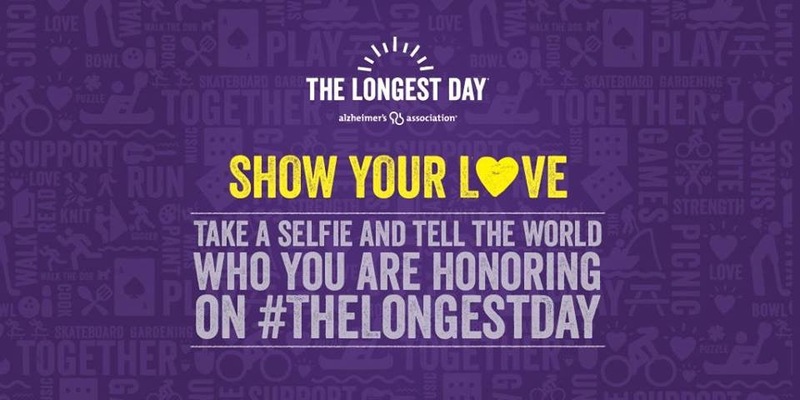 Share your photos, stories and fundraising successes on social media and show your love across the world by using the hashtags #TheLongestDay and #ENDALZ. For more information on how to participate, or to register, click here. Every dollar raised on The Longest Day goes directly to the Alzheimer’s Association to provide care and support to those facing Alzheimer’s, drive research toward treatment, prevention and a cure, and to advocate for the needs and rights of people affected by Alzheimer’s.